Acquisition brings increased presence for BHW in the Pacific Northwest Region. Demonstrates BHW’s continued commitment towards providing hope through opening more locations for families with Autism. It is because of our devoted partners (payers, patients, and providers) who continue their dedication to BHW that has positioned us with the opportunities we have today to reach more families. BHW started with a simple vision to provide hope to families throughout all corners of the world by delivering quality services. Because of our partners, this is becoming a reality. We understand that we cannot do this alone so we are sincerely grateful for our partners who have come alongside us on this journey. BHW intends to further our mission to reach more families and will explore additional partnership opportunities this year and onwards. Please visit douk.co for all partnership inquiries. 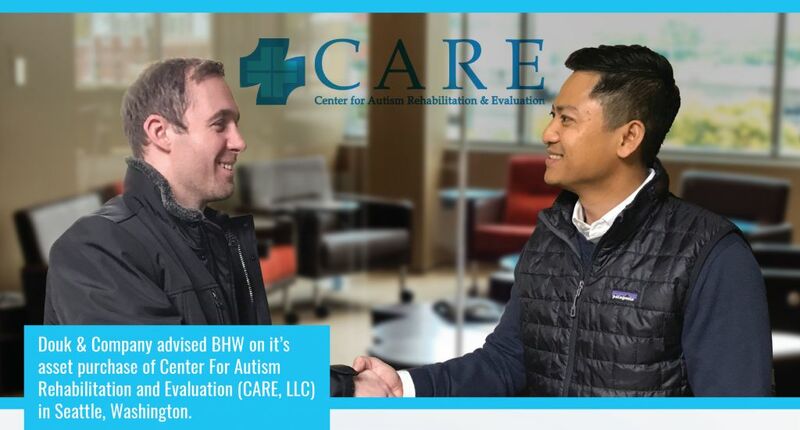 Behavioral Health Works, Inc. (BHW), a California-based company with branches nation-wide, helps individuals with autism and other developmental disabilities reach their potential by working collaboratively with families, schools, and relevant professionals. By focusing on ways in which people respond to their environment (behavior), we provide opportunities for them to learn in specific and observable ways, leading to a positive outcome (health).